In the complex process of a divorce, often the last thing a person thinks of is to make adjustments to their estate planning instruments. However, in Nevada, it is necessary to change your will and other documents after divorce, because the law invalidates certain provisions if you do not. This can pose problems for asset distribution, to say nothing of potentially rendering the entire will unenforceable. It is not uncommon for married couples to name each other in their wills and other estate planning instruments. Spouses routinely name each other as personal representative or at the very least, make sure the living spouse is well provided for after the other spouse’s death. However, upon the entry of a Divorce Decree, Nevada law customarily revokes any bequests to that spouse. It is possible, however, to avoid this automatic operation if you reaffirm your bequests after the divorce. 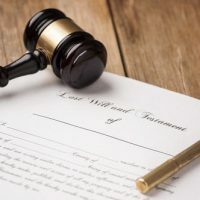 If you do not make a new will and distribute your assets accordingly, the law will operate to disinherit your ex-spouse, that they not receive anything. As such, it is highly recommended to execute a new will (and destroy the old one) as soon as possible after the divorce, either to redistribute assets so they do not pass by intestate succession, or to reaffirm bequests to your now ex-spouse. Another estate planning instrument commonly utilized is insurance policies. Changing your beneficiary after Divorce is something which you must address. However, many of these require outside paperwork to change. Generally, there is a process that must be followed in order to change the beneficiary. It is important to determine that process and ensure you make any changes in the proper manner. Also, it is important to be aware that some plans and retirement instruments are governed by federal law – more specifically, the Employee Retirement Income Security Act (ERISA). Retirement accounts like 401(k)s and pay-on-death bank accounts, as well as employer-issued life insurance policies, all fall under ERISA, meaning that the plan administrator must turn the funds over to whomever is named as the beneficiary – regardless of any state law or private will that might state the contrary. Estate Planning is often a stressful topic to consider, and more so when you are going through a divorce. However, it can cause serious issues in the future if you do not consider those details after your divorce. Calling a knowledgeable attorney can make a big difference. The Las Vegas divorce lawyers at the Kainen Law Group can sit down with you and try to guide you through the process. Call us today to schedule a consultation.